Once you have recorded your podcast as an MP3 file, you have to make it available to the world, and that means hosting it somewhere on the web. Where do I store my shows? Storage Space: Podcast files can take up quite a bit of space. If you were producing a 30 minute show every week, you’d need nearly 1 GB of space to store 8 months worth of shows. We’re in the UK, and our podcast has been hosted successfully with Namesco. They offer a range of packages including extras such as free domain names, multiple POP email inboxes and anti-virus / anti-spam protection. Prices do step up if you need more storage and bandwidth, but one of the Namesco business servers has served us well for years. More details: Namesco.co.uk. If you’re new to podcasting and don’t yet have suitable podcast storage in place, you should take a look at LibSyn. Prices start from $5 a month, for which they’ll host your podcast and offer truly unlimited bandwidth. You may want to opt for the $12 a month package which allows you to upload 250 Meg a month and provides download stats. 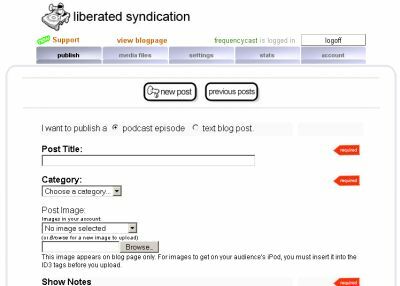 LibSyn also offers a basic homepage for your show, as well as the RSS feed that you’ll need to submit your show to podcast directories. Beware of providers offering “Unlimited Bandwidth”… as there are likely to be two Gotchas. One is that with unlimited bandwidth, there may be a sizable performance hit which could mean that listeners have a long wait for files to be downloaded. The second issue is normally buried in the Terms and Conditions. We were tempted to use Fasthosts, a provider here in the UK offering “Unlimited Bandwidth”, until we noticed the following in the small print: “Multimedia content such as audio and video is acceptable provided it is streamed to the user, links to HTTP download of this content is not acceptable”. 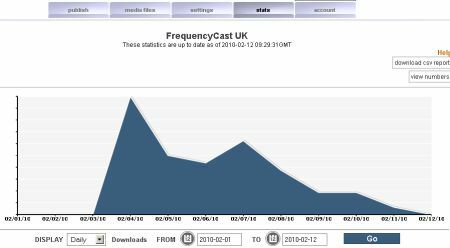 As the majority of podcast listeners download shows before listening, this would be a breach of Fasthost’s Acceptable use policy. Got a question on podcast hosting? Add a comment or question in the box below. hi i am thinking of doing a podcast and basically have no idea of where to start. how would i recored my podcast and how would i get it broadcast on the web? do you think there would be experinced podders!! who would be able to assist me? We should be able to help you – First off, take a look at https://www.podcastadvice.co.uk/make-your-own-podcast/ for get a feel for what’s needed, then work through the advice on these pages.